Have you ever gone to a neighborhood open house just to be nosey to see what the house looks like or to get ideas for your own home? Do you love to drive by houses in your favorite neighborhood at night with the hopes that people will have their lights on and shades open? Do you love the issues of interior design magazines when they showcase the home of a famous celebrity and you get to see how the other half lives? If you answered yes to any or all of these then you might be a home stalker. And I mean that in the non-creepy stalker way! 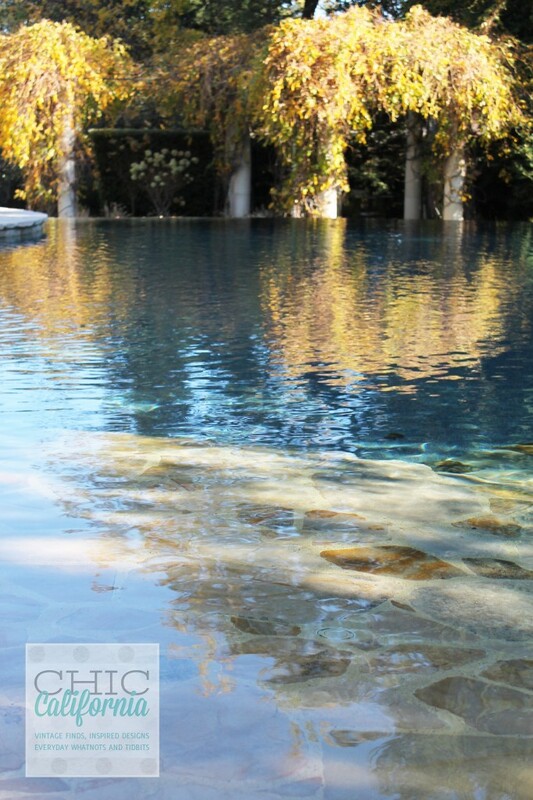 So for the next 3 days I am going to take you into 3 beautiful homes. Each one is totally unique but totally California. The first home is a French Country Estate. 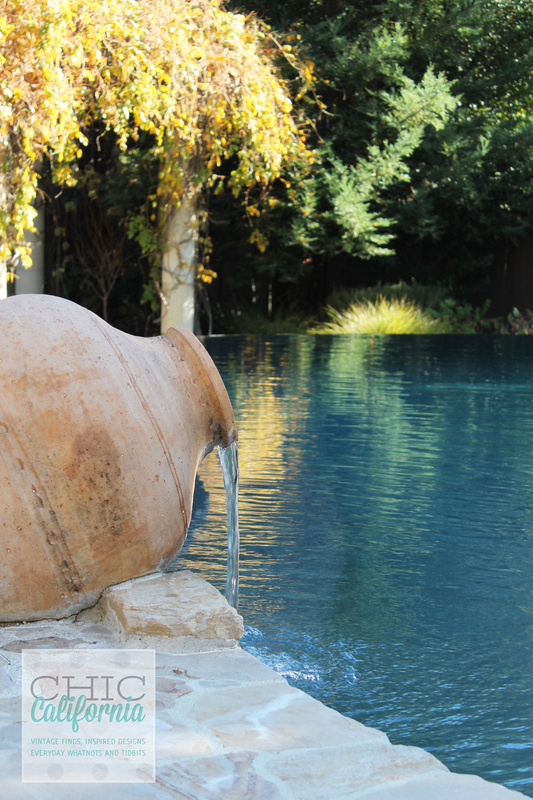 It has French elements, Mediterranean elements and elements of California living. But it was the simple details that caught my eye. Things that you can do to your own home. Alright so maybe growing a whole column of ivy in front of your home is out. 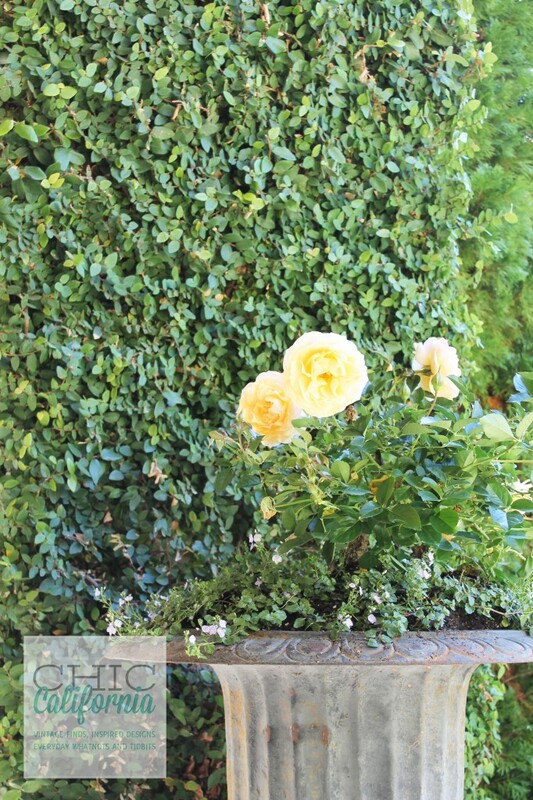 But planting something seasonal and inviting in a vintage urn will always welcome your guests. As soon as you walked in the door of this grand estate you were greeting by a huge entry, custom stone floors and of course the spiral staircase. 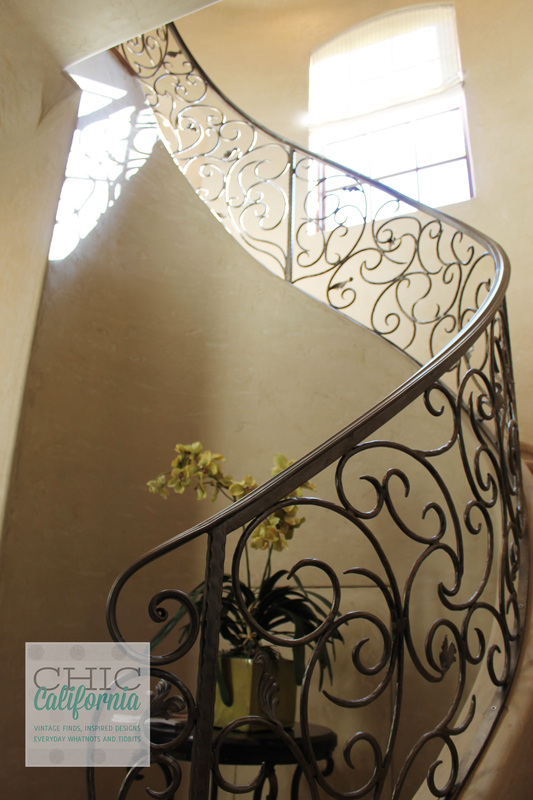 The ironwork on the front staircase (yes there was a back staircase too!) was designed by the homeowner and an artist. I am calling my artist ironworking friend right now to start working on my new banister. I don’t have an ironworking artist friend you say? Bummer! So maybe that was a little lot grand but this house did have a lot of little things that even the everyday homeowner could use as inspiration. 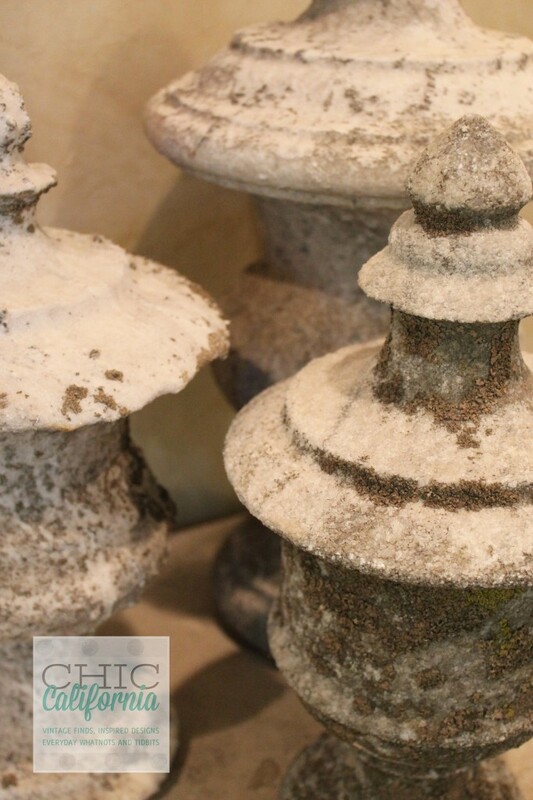 These garden finials were strategically placed on the buffet in the dining room. What do you have in your garden that you could bring indoors for the winter? Besides dead plants??? The more moss covered and the more the weathered the better. 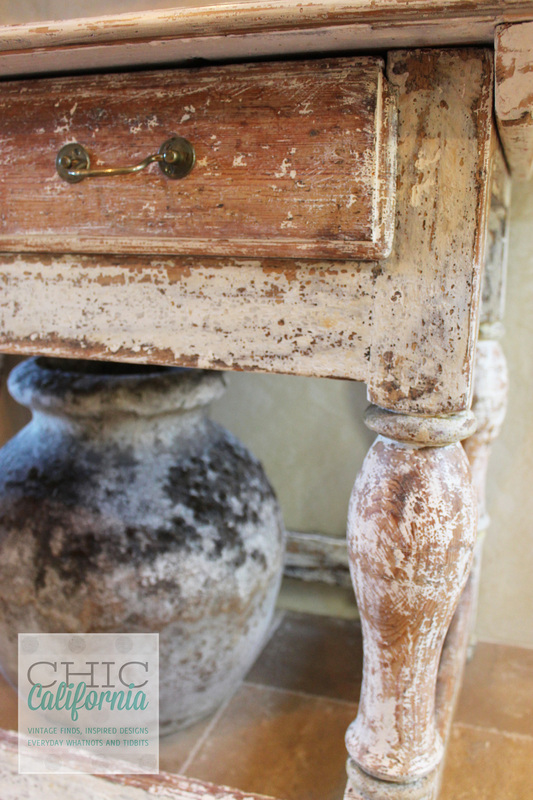 These are also pretty easy finds at vintage stores or even brand new vintage reproductions at a garden center. But it’s a great way to bring a little of your garden into your home. Do you have a giant wall in your home with nothing to put on it. Make a statement with something big, like doors. The next time you travel to the south of France simply come home with a pair of doors. Kidding!! Any doors, even new doors painted a vibrant color can make a statement in your home. PS, these doors also hid cords and outlets! I peeked behind them. Ok, here’s one for my fellow Mom’s out there. 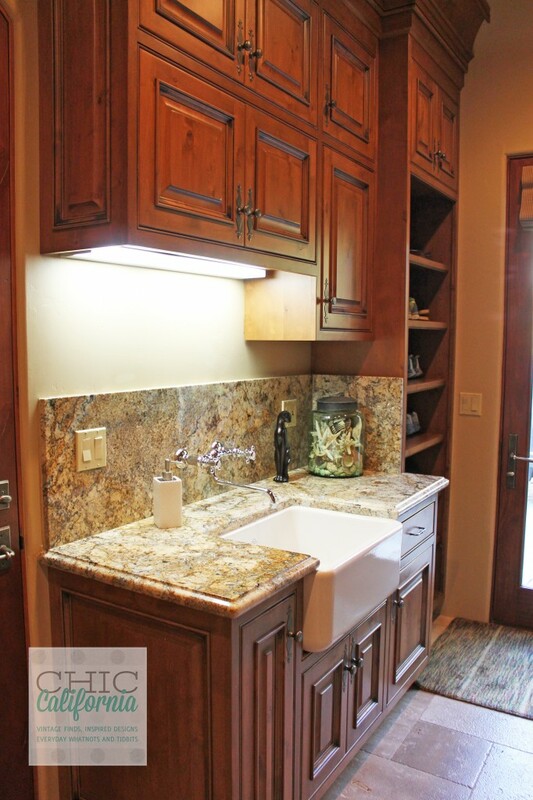 Wait till you see this………….Mudroom. Yes, it’s a Mom’s dream come true. A designated place for bookbags, shoes, coats plus a bench and cabinets for storage. Can you hear the angels singing????? How much do you want to bet you would still find your kid’s backpack in the middle of the kitchen floor? 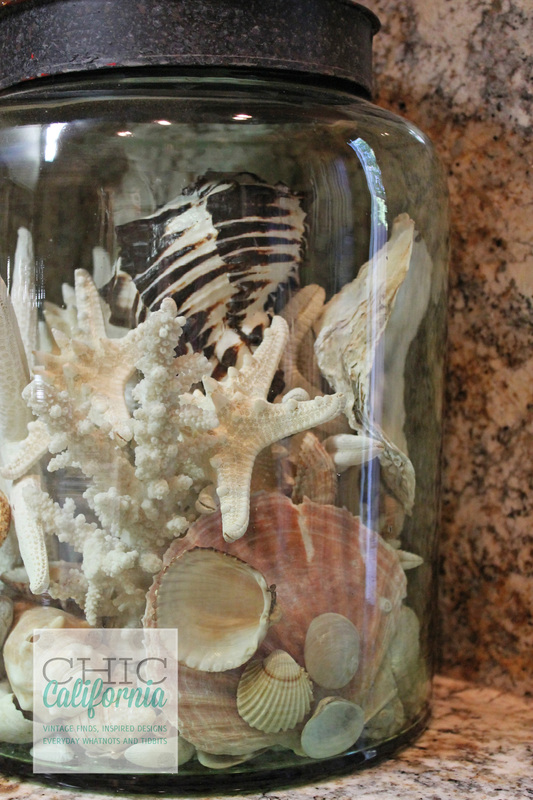 But maybe if you can’t have the custom mudroom, you could incorporate a jar of shells into an entry way or a laundry room. Where ever it is that you drop your coat and shoes and enter the comfort of your home. It’s the small things that count. On to the great room. 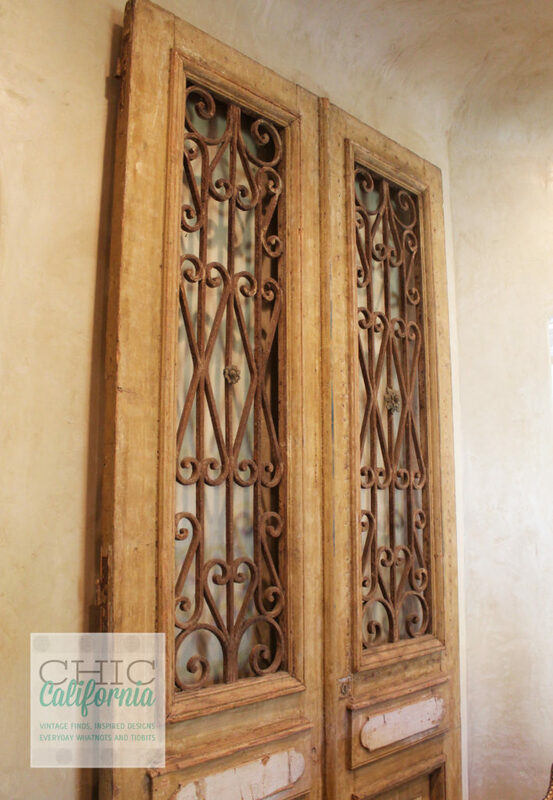 Here is another great idea to put into your home using, you guessed it, doors! 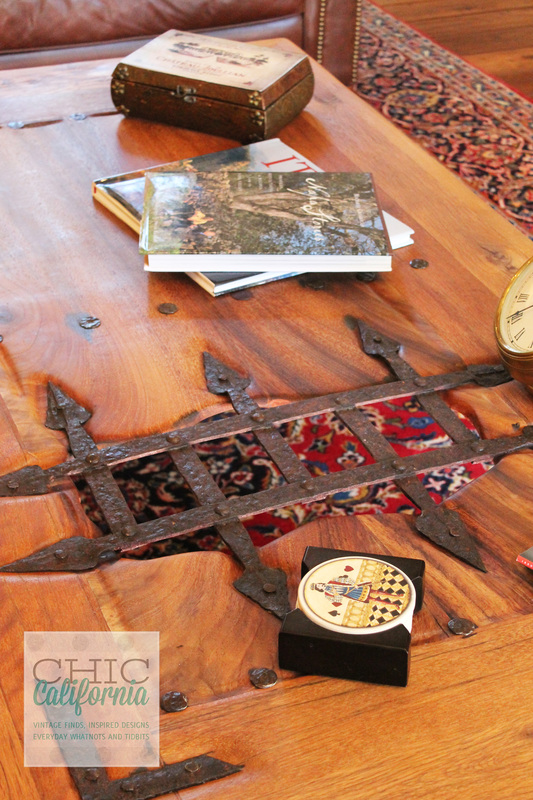 Turn a door into a coffee table. This one just happens to be a door from a Mexican jail. But again, any door will do. It will add character and a great conversation piece to your family room. Ahhhh, the luxury of a long hot bath with a view! But just when you think you have seen it all in such a grand home. There comes a room that will make you drool. Sweet Mama!!! 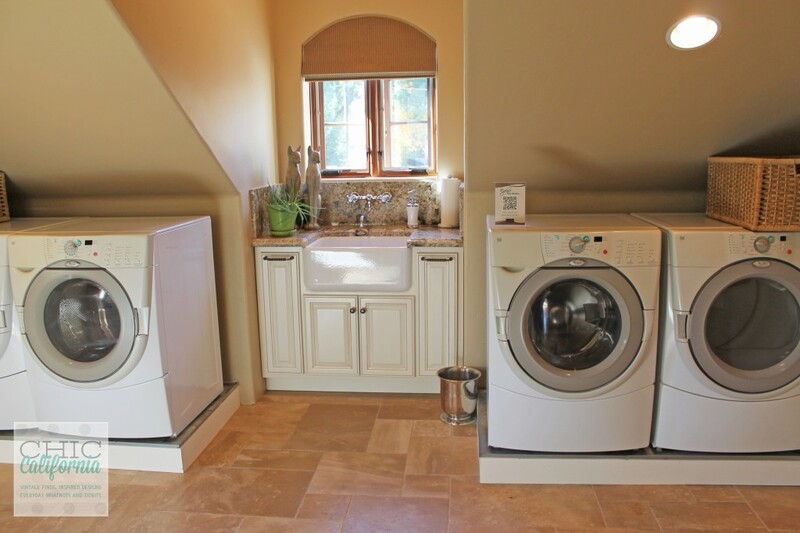 An upstairs laundry with 2 washers and 2 dryers. If this doesn’t inspire you to do laundry, I don’t know what will. And of course, this tour wouldn’t be complete without a picture of a fabulously chippy distressed piece of furniture. Now this is a really easy addition to any home. I hope this first home leaves you feeling inspired. 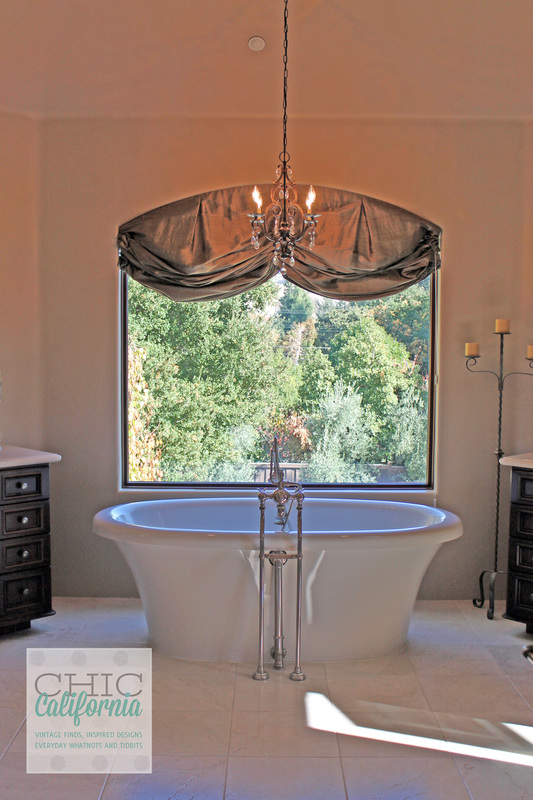 Don’t forget to subscribe to Chic California so you won’t miss out on tomorrow’s feature home.